OAAGHG was organized in 2000 from a group of friends who met informally around their interest in genealogy. We were incorporated by the State of Ohio in the Spring of 2001 and recognized as a federal non-profit 501(c)(3) organization during the summer of 2002. OAAGHG is dedicated to encouraging support for African-American Genealogy and Historical Research. In order to reach and welcome as many people that have an interest, OAAGHG is proud that all of our programs and activities are always FREE and OPEN TO THE PUBLIC. We welcome support from individuals, organizations, institutions and businesses who want to help us continue to provide valuable assistance and information to those with an interest in African-American genealogy and history. Your name will appear on our sponsors page identified as sponsoring a FREEDMAN. Your name will appear on our sponsors page identified as sponsoring a FREEDOM SEEKER. Your name will appear on our sponsors page identified as sponsoring an ABOLITIONIST. Your name will appear on our sponsors page identified as sponsoring a CONDUCTOR. Your name will appear on our sponsors page identified as sponsoring an AGENT. If you are sending a contribution by mail, please alert us using our contact form. 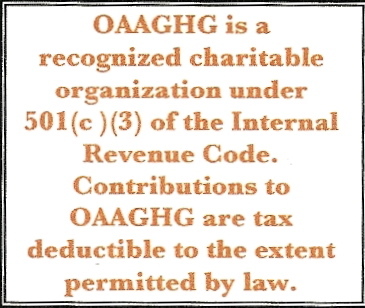 OAAGHG thanks you so much for the care and support you have shown by your financial contribution.